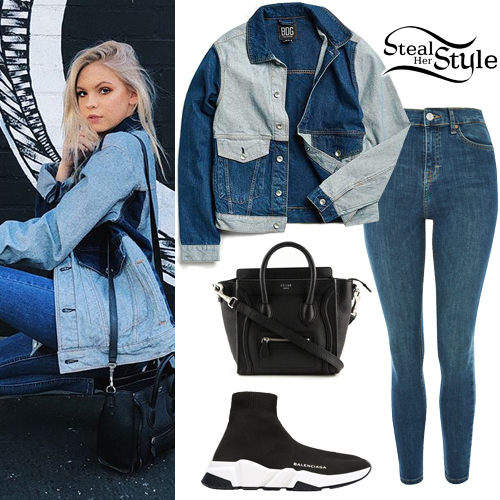 Jordyn Jones posted some pictures on instagram wearing a Brandy Melville Abi Crop Sweater ($35.00), Topshop Moto Super Rip Jamie Jeans ($80.00), a Gucci Tian GG Supreme Backpack ($1,290.00) and Call It Spring Embrey Boots ($69.99). 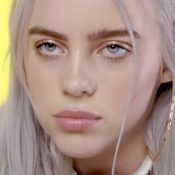 Jordyn Jones attended the 5th Annual Beautycon Festival Los Angeles at the Los Angeles Convention Center wearing a Brandy Melville Hailie Top ($18.00), House of CB Tonino Tassel Skirt ($135.00), Luv aj Ring Of Fire Statement Earrings (Sold Out) and Alexandre Birman Caged Bootie ($279.99 – similar style). Jordyn Jones was spotted arriving at Variety’s Power Of Young Hollywood event held at TAO in Los Angeles wearing a Patterned Swimsuit (Sold Out) and Tuxedo Trousers (£19.99) both by H&M, a Small Kate Monogram Leather Chain Shoulder Bag ($1,650.00) and Monogram Descontructed Earrings ($445.00) all by Saint Laurent, with Aldo Caraa Open-Toe Heels ($80.00). 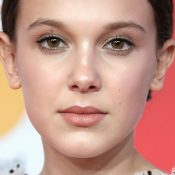 Jordyn Jones attended the world premiere of ‘Valerian and the City of a Thousand Planets’ held at The TCL Theatre in Hollywood wearing a Lace Embellished Bodysuit (Not available online) and Trousers with Star-Shaped Studs (£284.37) both by Elisabetta Franchi, a Rachel Katz 14K Black Gold Cage Ring ($1,800.00) and Gianvito Rossi Glam Ankle-Strap Sandals ($659.00 – wrong color). 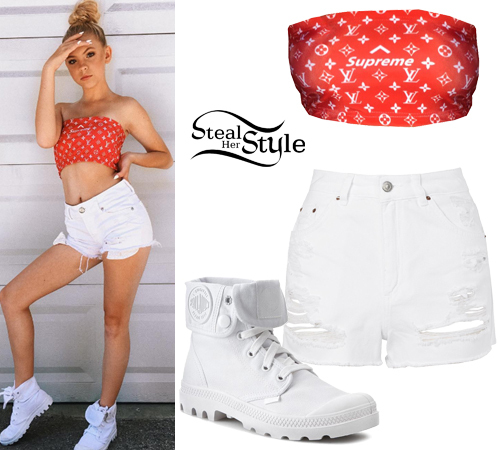 Jordyn Jones posted some pictures on instagram wearing a Freak City L.A. LV Supreme Tube Top ($99.00), shorts like the Topshop Petite Ripped Shorts ($60.00) and Palladium Baggy Boots ($59.99). Jordyn Jones attended the World Premiere of Spider-Man: Homecoming last night wearing Emanuel Ungaro Spring 2015 Dress (Not available online), Jimmy Choo Celeste/S Clutch ($975.00) and Imagine Vince Camuto Valora 2 Platform Sandals ($79.96). Jordyn Jones posted a picture on instagram a few days ago wearing the Are You Am I Ling Bandeau ($79.00), Elwood L.A. Rose Souvenir Jacket ($48.00), Topshop Midnight Jamie Jeans ($75.00), an Urban Outfitters Green Nylon D-Ring Belt (£2.00) and Aldo Caraa Open-Toe Heels ($80.00). 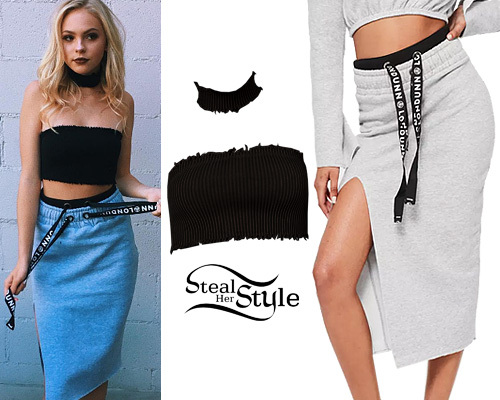 Jordyn Jones posted a new instagram photo earlier this month, wearing a Sorella Rib Knit Choker Tube Set ($54.00, Taupe) and a Londunn + Missguided Grey Fleeceback Raw Gem Midi Skirt ($50.40). 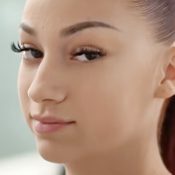 Jordyn Jones posted a picture on instagram a couple of days ago wearing a Champion Reverse Weave Hoodie Sweatshirt ($54.00), Topshop Moto Ripped Jamie Jeans ($75.00) and Nike Air Force 1 Mid Sneakers ($94.99).